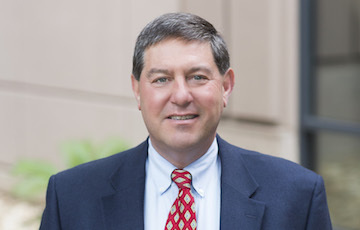 Having worked in banking and financial services for over 25 years, Randall Rhyner can assist his clients with all aspects of their financial lives. In addition to asset management, Randy reviews liabilities, risk management, and estate plans. He emphasizes long-term, risk-appropriate wealth management strategies to grow and preserve clients’ wealth to meet their goals. Randy graduated from the University of Missouri-Columbia with a BA in Economics, he holds FINRA Series 6, 7, 24, 31, 63 and 65 Securities Licenses, and he is Insurance Licensed in Kansas and Missouri. Randy earned his Certificate in Financial Planning from the University of Missouri-Kansas City in 2001. In addition, he has received the Five Star Wealth Manager award every year from 2011 to 2016, and he has served on the Smith Moore Board of Directors since 2014. Outside of the office, Randy enjoys golf, racquetball, and watching his daughter’s volleyball games. He is a member of Church of the Nativity, MU Alumni Association, and Blue Hills Country Club. Randy and his wife, Karen, reside in Leawood with their daughter, Rachel. He welcomes the opportunity to meet with you to learn about your specific situation and explore whether he can be of benefit to you. Please contact Randy by email at rrhyner@smithmoore.com or by phone at (913) 491-2602.